ANNAPOLIS, Md. – Baltimore protesters chanting “Black lives matter” gathered in the Maryland State capital Jan. 15 to demand that the legislature enact laws to end the plague of police killings in Maryland. The big, multiracial crowd, mostly youth, gathered in “Lawyers’ Mall” under a statue of the late Supreme Court Justice Thurgood Marshall, a native of Baltimore. 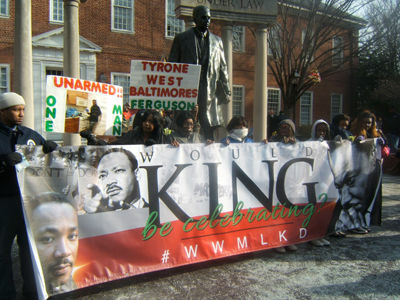 They held a banner with a photo of Dr. Martin Luther King Jr. “Would Dr. King Be Celebrating?” the banner asked. Tre Murphy, a leader of the Algebra Project, a high school youth group in Baltimore, told the crowd that if the Rev. Martin Luther King, Jr. were alive he would not appreciate churches and established civil rights organizations that have remained silent. “We are at a critical time in history, a time to create a better future,” Murphy said, urging an outpouring of protests against the killing of innocent, unarmed Black men by racist police officers. 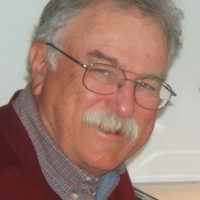 Tillett listed the specific legislation the Maryland lawmakers should enact: Take advantage of an offer by the Obama Administration to help pay for “body cameras” to be worn by every police officer; legislation to require that an independent prosecutor deal with any case of death or bodily injury caused by a police officer. Tillett also urged the legislature to enact legislation to require every municipality to create police civilian review boards to curb police use of lethal force. Tillett said a law requiring the appointment of a “special prosecutor” is urgently needed to end the “conflict of interest” warning that “no one is going to believe the decisions rendered” by a Grand Jury named by any prosecutor who works hand-in-glove with the local police. The crowd then walked to a legislative meeting room in a nearby building where the Judiciary Committee was holding its first meeting of this session. The crowd packed the room with a standing room crowd that listened in silence as the lawmakers introduced themselves. Rep. Jill Carter, a delegate from Baltimore said, “I want to welcome the guests we have here from Baltimore.” She vowed that her “first priority” as a legislator would be to address the legislation the crowd was demanding. The brief meeting adjourned. Rev. Brown then told the crowd, to get accustomed to this room because this is where hearings will be held on legislation to end police brutality. “We will be coming back,” Brown said.